It can be reasonable that someone could think about Lanzarote as a volcanic land with no so much life in it because of its volcanic origin and the desert landscape. May its inhospitable appearance looks like a martian terrain, but the truth is that the island is a fertile and arable land. One of this fields is La Geria, the land of the wine in Lanzarote. The last Timanfaya’s volcanic activity between 1730 and 1736 has everything to do about the current appearance of the area. The residues and ashes of those eruptions gave to La Geria its distinctive black colour. The cultivation of vines was possible in here thanks to the inventiveness of man. Cones were dug in the ground with a few meters of diameter. The plants like vines and fig trees are planted in the cones. Thanks to the depth and the little walls around, the plants are covered from wind and the humidity remains in the terrain. This cultivation technique made possible a spectacular landscape and is a prove of the adaptability to the environment of the human. La Geria became one of the most important wine regions in the island. 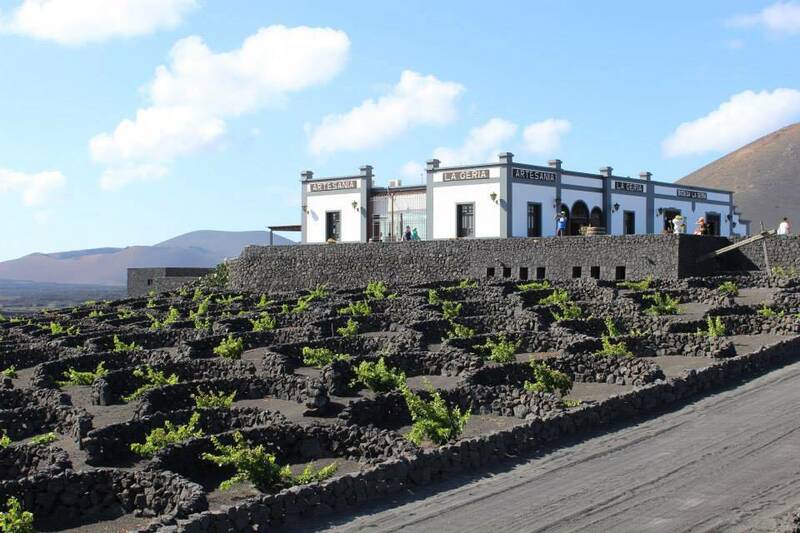 With a unique method of cultivation, wines of Lanzarote got in 1993 the Denomination of Origin. The malvasía grape is the variety most extended in the island because of its better qualities to grow in this particular land. This kind of winegrowing needs the support of everyone to last, due to its traditional character. In the 70’s, tourism replaced agriculture as the main economic activity in Lanzarote, and many farmlands were abandoned. Nowadays, the Salvar La Geria project try to preserve a unique cultivation model and the land where this take place. Within this project is the Wine Run, a spectacular run through the vineyards that has as objective to preserve La Geria and its traditional way of farming. This race is made not just for runners but for solidary people who like the effort and the final reward. As the project claim says: La Geria, saved by everyone and for everyone. Travel around Lanzarote and discover all its special places. Stay with us in Sandos Papagayo Beach Resort and enjoy our fabulous All Inclusive.